Hey, hey! 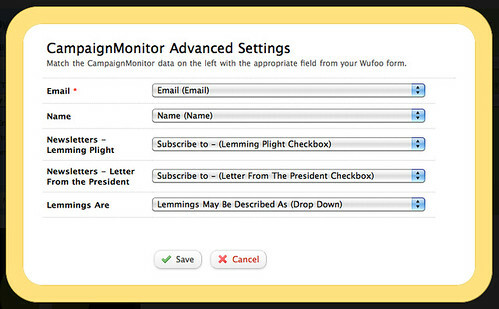 Today, we’ve made a few upgrades to our [Campaign Monitor integration](http://www.wufoo.com/partners/campaignmonitor/) to provide full support for their [custom fields](http://help.campaignmonitor.com/topic.aspx?t=154 “Campaign Monitor Custom Fields”) feature so you can use them with Wufoo’s Multiple Choice fields, Dropdown fields and Checkboxes. Now, you can use the full power of Campaign Monitor’s segmentation and mail merge capabilities with these improvements. Bam! How do you like them apples? Accessing these new features is a snap. On the Campaign Monitor side, just add one of the newly-allowed fields you’d like to use in your mailing list. For example, add a Campaign Monitor “multiple option” field, which allows you to select several options from a set of predefined choices. With this field set up, you could zip over to your Wufoo [Field Matching](https://help.wufoo.com/articles/en_US/kb/Integrations/#match “Field Matching Documentation”) settings to match it up to a set of checkboxes. While we’ve always supported the Custom Fields feature, our field matching integration only worked on a limited number of fields and couldn’t be matched up if you were using any fields with fixed choices (like dropdowns, multiple choice/radio fields and checkboxes). Thanks to our new changes, this restriction has been lifted and you can now match these fields easily to the corresponding versions on Campaign Monitor’s end. How can Custom Fields be used to simplify your workflow? Well, imagine you have a foundation to save The Lemmings, and you’re building an email list of parties interested in receiving info about their plight. If you don’t want to create just one big list (because different people want only certain information about the Lemmings campaign), you can use Custom Fields to categorize users in your list and isolate them when needed to send them focused email messages. 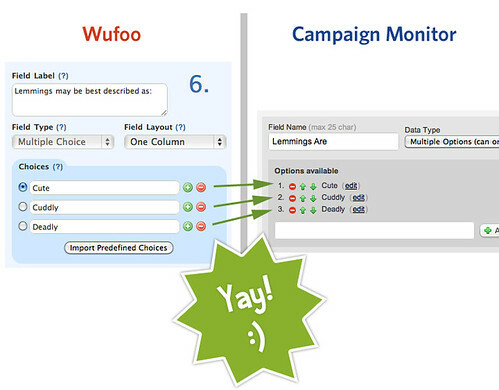 One thing to keep in mind when you add Custom Fields is that the data has to match up exactly on both Wufoo and on Campaign Monitor’s end. 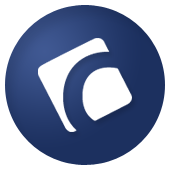 This means that if you add, edit or delete choices associated with your field in Wufoo (or visa versa with the Custom Fields in Campaign Monitor) then you have to add, edit, or delete the data in the exact same way in the other application–otherwise the unmatched value will be ignored on submission. This is because Campaign Monitor silently ignores values it does not recognize for fields based on fixed choices (they don’t pass an error back to us), so you must be careful to properly associate your fields when you set things or change them or you’ll get incomplete data in your leads. For this reason, we suggest that if you’re using the Other text input option on Multiple Choice fields that you do **NOT** match them to any Custom Field. To learn more about these features and what to keep in mind, be sure to check out our [custom field documentation](https://help.wufoo.com/articles/en_US/kb/Integrations/campaign-monitor/#choices “Custom Fields Documentation”). So, that’s it. We’re happy to extend these features to all users across all accounts in Wufoo and can’t wait to see how you’ll use them to create successful campaigns. Previous Post: Got an API Contest Idea? Perfect. You guys must be on something – or you’ve hired a bunch more quality developers? Posted July 15th, 2010 by Rob Holmes. Posted July 15th, 2010 by Chris Campbell. A minor tweak to this would allow us to turn off our Wufoo -> Campaign Monitor integration code completely (http://wufoo.com/forums/viewtopic.php?pid=4540#p4540). This would allow us to set a single line text field with a predefined value indicating the “source” of this email subscriber as being this wufoo form. 2) Give an additional option in the select controls on the “Match Fields” screen with allows the form name to be passed through. We would prefer option 2 (and this might have less impact on other areas too). Posted July 15th, 2010 by Tim Sabat. @Tim – thanks for your suggestion. We have ended up (after advice from Andrew at Wufoo) deciding to create a text field which has a predefined value. We will hide this field using CSS. We then map the hidden field through to the corresponding field in Campaign Monitor. This approach allows us to very easily and quickly (no techy involvement) create new forms. We investigated using an field visible by admin only (and even using rules to hide the field based on the field itself not being empty). Both hide the field effectively – but they also result in the field value not being submitted. The ideal solution would be for Wufoo to create a new hidden field type in the editor (which they say is not planned at this stage). But for now we have big grins on our faces anyway because we can archive some code. 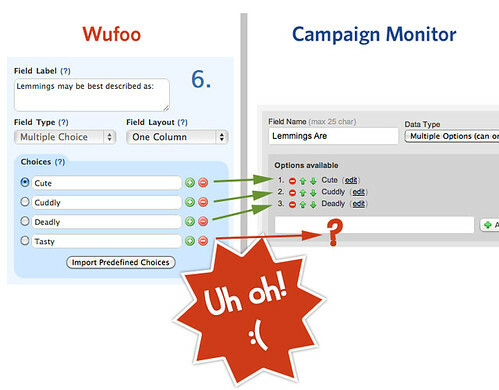 I just set up a Wufoo/Campaign Monitor integration and noticed what seems to be a small bug…. I wanted to match up a field in Wufoo that contains a single checkbox with a ‘Multi-Options (select many)’ field in CM (the Wufoo field will have additional checkboxes added at a later date). The problem is that Wufoo won’t even display these fields in the ‘Match Fields’ dialogue UNLESS there’s MORE THAN ONE option defined for the corresponding Campaign Monitor field. I’ve worked around this by simply adding a ‘Test (do not delete)’ option to the field in CM, but obviously this is less than ideal. Posted July 15th, 2010 by Matt.